A year after its release, we take a look at the updates coming to Adobe XD. Has it really been 12 months since Adobe launched a preview of its prototyping tool, Adobe Experience Design? 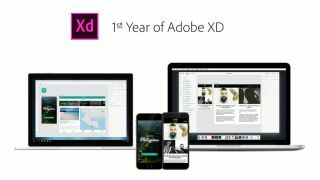 In that year, Adobe XD has established itself as a key part of Creative Cloud, with designers using the software to bring their inspiring ideas to life. There's always room for improvement, though, and Adobe XD is no exception. Announced alongside the major updates for Project Felix beta, Adobe XD has been given a number of upgrades that make it easier to pass on feedback and enhances design capabilities for Windows 10. So, what can users expect from the updates? Find out below and head over to the Adobe XD blog to read the full details. Keeping on top of feedback can be difficult at the best of times. To make it easier to manage incoming feedback, the resolved comment thread moves chit-chat away from the main view and into a separate area. Users can switch between unresolved and resolved comments as they wish, and even move resolved comments back into play if needed. Windows 10 users finally have access to the zoom tool. Simply click to zoom in and alt+click to zoom out again. Need to get a good look at something but only temporarily? They've got this covered, too. Just press and hold ctrl+space to enable the zoom tool and let go to return to your previous tool. This is the big one. Windows 10 users can now quickly copy and paste vector shapes from Adobe Photoshop CC and Ilustrator CC into Adobe XD. To do this, you need to fire up Photoshop and make a selection using the marquee tool, use the Copy Merged option to select the content from multiple layers and paste the selection as a bitmap into XD. On top of that, you can bring in SVG content by using Photoshop's Copy SVG feature. After you've copied and pasted everything into one design, you'll want to make sure they're rounded to the nearest whole pixel before you export the assets. To do this in Windows 10, all you have to do is launch the context menu with a right click, and select 'Align to Pixel Grid'. XD does the rest of the work and makes sure assets have the highest fidelity on output. The final big announcement from the March update is the ability to easily scale paths like icons. All you have to do is select the aspect ratio lock in the property inspector in Windows 10 and hey presto! All of your resize operations are always aspect locked.